If you're caught up on Part 1 of our trip, let's move on to the fun at the beach! As soon as we arrived, I took Max out to the back patio to listen to the waves while Steve and Abbey got Max's new beach chair ready. It's called a Mobi Chair, it's a wheelchair that floats. 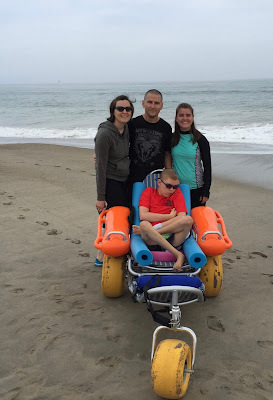 Oxnard beach has beach wheelchairs to check out, but it wouldn't allow for us to get Max in the water, and there wasn't enough support for him to sit unassisted. With the Mobi Chair we are able to recline him enough for him to sit on his own and he's able to get in the water too. Max's nurse and I got him changed into his new surfing shorts and Batman rash guard and he was ready for the ocean. Naturally, his feet found the sand first. He wanted to drag them along in the sand the whole time, but of course that wasn't safe. We got him ready and off they went. It was a good trek out from the house to the shore. That was something that was a little deceiving in pictures. Steve thinks it was about 500ft from the house to the water. He pulled the chair and someone would push from behind. The chair was much easier to push on the wet sand. It was the deep, dry sand that was more difficult to maneuver through. Nearly there!! At this point Max was so excited!! They were all very excited to get in the water! You see this picture? 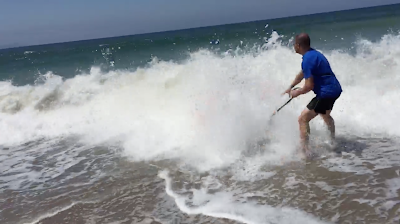 It was the last one before I got knocked down by a wave. Max got wet and I went to turn around to take a picture and wham! it got me. This is also a good point for me to say while the rest of my family loves the roar and power of the ocean, it scared the jeepers out of me! So I was a bit in a panic while we were by the water with Max. If I was down there without him I could distance myself from it. Max wanted to be IN IT so I just had to hold my breath and know his daddy wouldn't ever put him in danger! He loved it....loved the cold. Loved the roar. Loved the being splashed by the waves. Just look at that face! But, shortly after being in the water, he experience what everyone at the beach experienced and can usually take care of on their own....sand in the pants. Only Max had to sit on it, and needless to say it was very uncomfortable. Steve got him out of the chair to try to rinse him a bit, but I think it caused more sand than got rid of it. He still liked being in the water, but after this we needed to take him back to the house to get cleaned up. Day two was more of the same...lots of fun and some more sun! It's hard getting all four of us in a photo when I'm always taking the pictures. But this was one of my attempts. Here are some close ups of Max's chair. We added the padding on the foot rest and the pool noodles. It has straps/belts to help hold in but he didn't need them once we got all the noodles set up correctly. I think we will use them for the pool so he doesn't float away, however. On our third day to play, we went for an early morning walk along the water. Max was feeling tired this day, and ended up hanging with his nurse while Steve, Abbey and I went with our friends to see some sights before coming back for more time at the beach in the afternoon. Steve gets best daddy award a hundred times over for all the hard work to ensure we all had this wonderful trip. 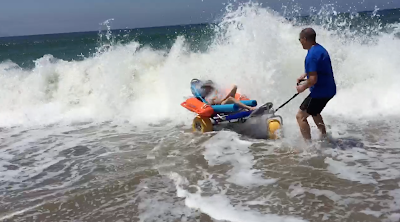 Especially all the physically demanding work of moving Max around, even with a cracked rib he got the one time he got playing in the water while Max was sleeping. Here we are! A picture of the four of us thanks to Max's nurse snapping it. You might have to zoom in on this one, but just look at those toes! He was always so thrilled to be by the water! His nurses were able to be with him for all the fun too. This is his nurse Molly, before she departed. And his nurse Rachel, she hung out with him the rest of the time during the days. These are more shots from that evening. We chased down a kite surfer and watched the sun set. Here was another way to get all four of us in the shot! We all had bedrooms to stay in, but Max camped out in the living room. We put his van mattress on the floor and surrounded him by pillows. The house did not have a good seating option for him, so he spent a lot of time on his bed if he wasn't in his wheelchair or sitting with Steve on the couch. He was happy to have the sea breeze and to listen to the waves all night. This is the only photo I have of him with his nurse Charity. She was working nights so didn't get to go to the water with him before it was time to leave. They watched the sun set together on the last night there. I'll end with videos from our beach days. I'll end this post of our time at the beach with this video. Steve loves it....it makes my heart jump every time I see it. Again, Max was not in danger and he LOVED it. Nurse Rachel was there and said, I think at one point he was completely under water. Steve said, no way....then we captured the screen shots. Oh, I watched each video and am just grinning! How wonderful that you all gave yourselves and Max this delightful vacation. I KNOW how hard it was, but it looks beautiful, too. I only wish that I'd been able to visit with ya'll.